often and try all your options. word for word. You will miss a lot of cool videos and a lot of fun. inventory. This is crucial to the completion of the adventure. course I will provide you with the correct response(s) in the text below. This Image is your Map to the various worlds you will travel to. Click any of the Worlds to jump to that portion of the Solve. Talk to the prisoner . Use the key on prisoner - it will break. Show it to him until he says something about "screwdriver". Get the dirty sheet off the bunk. Look at the square hole in the center of the grate flooring. There is an object beneath the grate but you cannot reach it. Stuff the sheet in toilet and flush to flood the room. has now floated into grabbing distance. Go to door on left then zoom in on plate next to door. all the screws and reveal the back of a touchpad. There is a 9 button touchpad. and taken off to be tortured by the warden. Talk your way off of the rack  then . Grab the gun as it flies off the robot and kill the warden. Get the gun and keys from what's left of the warden. Get the battery from your dying friend. Head down the hall shooting all robots. Aim for the yellow flashes. Enter the Pod Room and click on the Pod Shield Control to Zoom In. Put the broken keycard in the right slot. It gets stuck. find the matching keycard for the left slot. the handle. Insert the battery. Now zap the broken card with the gun to open the panel. 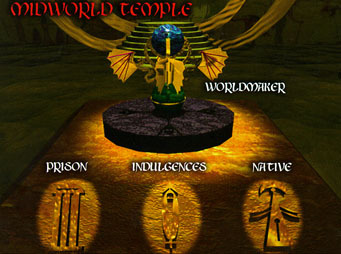 Crystal and return to the Midworld Temple. Talk to the plants  to prove you are worthy to pass. your inventory. Read the poem where the napkin used to be. worth it to miss once just to see Riana blow chunks. Click on the statue and look in the water but DON'T DRINK! Click your glass on the statue to transform him into "Buns of Granite". Now look in the water to find a piece of an upcoming puzzle. puzzle with the final piece from your inventory. Sniff Blue-Red-Yellow to make green sprouts appear in the bushes. Sniff Red-Blue to turn those sprouts purple. Sniff Yellow-Red to turn top flower purple and open a path through the plants. Enter the big flower and talk to the "Geni of the Lava Lamp" . add it/him to your inventory. over you will have the Blue Crystal and return to the Midworld Temple. Talk to the Medicine Man  and get the gourd. Enter the hut on the left and find the "kinda broken" dish. Touch the egg and make a note of the shape of the "Big Knife". Not much left to do here right now, so exit the village to get the Island Map. from the woods on the right. them to the side until you find a stone disc covered with maggots. Use the Palm Frond to sweep away the maggots and take the disc. it with the slime. Return to the beach and fill the bowl with water. Head to the interior of the island and go to the Purple Mushrooms. Water the thirsty plants with the water in the bowl. When the bees arrive use the gourd to capture each of the bees. Return to the beach and refill the bowl with water then go to the volcano. into yet. Now go look at the other guy and get the uneaten blue fruit. Take the fruit into the hut on the right. you saw when you touched the egg earlier. mound between the flowers you watered earlier. Watch the tree grow and take the fallen fruit. and return you to Midworld with the Red Crystal. have a brief encounter with Javelin. up with the Evil Stranger. Talk to him  to buy yourself some more time. to him  to continue to the next set of doors. to him  and continue your journey to the top of the castle. case of acne . Pushing him out the window is your last official act. The castle will blow up and you will be transported back to the "real world"
for my autographed copy of the game.